US-China relations are caught in a critical point — poised between one paradigm and the next. In thermodynamics, a critical point or critical state describes the end of a condition or a phase of state that is followed by a distinctly different one. In chemistry, the term similarly describes the moment when two phases of a substance becomes indistinguishable — for example the state when a substance is poised between a liquid and a vapor — before another critical phase or change. In a way, the ongoing U.S.-China disputes have quite a few similarities with thermodynamic changes or chemical reactions. We may take the U.S. strategic tolerance of China’s rise — or more specifically China’s active involvements in the U.S.-led world system — as an example. 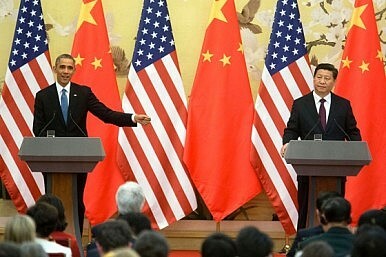 China has been actively involved in international institutions over the past decades, probably with the encouragement and tolerance of the United States as long as several conditions were met: first, that China does not truly challenge the U.S. predominance; second, that China takes up its shared responsibilities under the U.S. leadership; and third, that China changes domestically (or politically in a sense) as the United States has been expecting. However, the evidence seems to have proved that China’s “bandwagoning” strategy in the world system has been a positive for China but not necessarily for the United States. Thus U.S. strategic tolerance of China may be changing, evolving, and possibly going into a “critical point” before moving to a different state — for example a total collapse, or a burst in a more violent context. We’re already seeing examples of change. Reforms in dominant world financial institutions are being delayed by the United States in one way or another, even as IMF has just decided to include China’s renminbi in the SDR basket. Newly created regional institutions like the Trans-Pacific Partnership so far critically exclude China, and the United States still tries to confine China’s growing ambition with both the traditional alliance system and current international regulations and institutions (as most evident regarding China’s territorial disputes with its neighbors). Given the tensions between the United States and China, these moves all can be viewed as signs of a possible critical change. The point is that China does not seem to be intimidated with regard to all the above issues and there seems to be a draw (although not a power parity) between the two. That momentary pause before another shift represent a critical point (in the thermodynamic sense) for the U.S. tolerance of China’s rise under its prevailing leadership, which the United States now believes to be threatened. What’s next is absolutely consequential, if not catastrophic. Extending the metaphor of a chemical reaction process between the U.S. and China, there must be catalysts to Washington’s level of tolerance of China’s rise. Obviously, the uncontrolled escalation of discord over issues like South China Sea and cybersecurity issues may be the most dangerous catalysts. Hence it is critically important and necessary for both countries to find anti-catalysts that may stabilize this critical state and make it a protracted one — no matter how much both sides may hate to have a “draw” and wish instead for a quick change. Simply, the point is to find a strategic equilibrium where both China and the United States can compromise and reconcile. Compromise from both sides over the critically dangerous issues obviously is the simplest but most effective anti-catalyst to stabilize both U.S. tolerance and China’s impetuousness and thus to ease the ongoing tensions between these two powers. The need for compromise is obvious and almost a cliché at this point. But compromise among great powers like the United States and China is absolutely an art, and it is the truly urgent for both countries to learn to co-exist before the ongoing chemical reaction turns violent, the critical state collapses, and an irreversible chain of actions and reactions take place.